One of the best things that comes from blogging about books is all the great books you find through other reviewers. This is one such book. 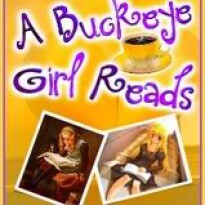 Mandi at SmexyBooks wrote such a great review of it that I was immediately intrigued by the book. It has everything I love in a book-it's set in the 1800s (always a plus!) had a paranormal theme (a bigger plus!) it was set in London (an even bigger plus!) and the name and the cover of the book were just cool...so I went to my library's website to see if they had it, and imagine my shock and surprise to discover that they did indeed have a copy of it. There was already a waiting list of 4 deep-but somehow I got my copy super fast, and the read was even faster. 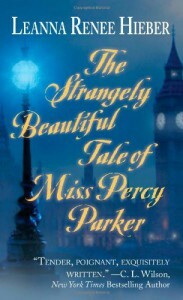 This is one of those rare books that pulls you in from the beginning and you tend to forget about other things in life while you read about the tale of Miss Percy Parker. In London a group of six children are gathered together. They are unsure of what awaits them or why they were gathered together. They are told that they will become apart of a group called The Guard, and it's their job to protect humans from the spirits. There will be a seventh member of the group that will join them later, and she will be a peer..there will be signs to her arrival, but there will be those who will send false signs as well, so they must decided who their seventh will be carefully. Alexi is chosen to be the leader of the group, and has the power of fire..he is told that he will love the seventh member. The other members of the group are: Rebecca , Michael, Josephine, Elijah and Jane. Each has a different power to help them fight off evil. As the group gets older, they go into society and all have different, normal everyday jobs. Rebecca is headmistress at Athens Academy, and Alexi is a professor of Science there. All have very complicated relationships with each other..all are friends, but yet hints of romance are never very far away from different pairings within the group. We meet Percy Parker as she enters the Athens Academy as an older student. The convent which she has grown up in isn't sure what to do with her, so they ship her away to school. She has the ability to see and talk to ghosts. She also speaks many different languages-some of them are ancient and no longer used. Her skin and hair are pale white and makes her different from everyone else..she makes a friend for the first time at the school-Marianna. She excels in all of her classes but one: science. Alexi offers to tutor her, and a friendship is formed. My thoughts: I think what I loved most about this book was it's original plot. There are books about ghosts, forbidden romance, fighting evil and self discovery- but this one was just different and I can't quite figure out why. There were some moments when I found my self shouting out to the characters: "No, you idiots!! You are wrong!" "Wake up already, you morons!" When the book ended I immediately wanted the stories of the members of the Guard. This book is perfect if you are looking for a quick, easy read.